It makes a nice change to be able to compliment an official government report. Ever since the House of Lords report in 2000, the government has been vacillating about what should be done about herbalists. At the moment both western herbalists and traditional Chinese medicine (TCM) are essentially unregulated. Many (but not all) herbalists have been pushing for statutory regulation, which they see as government endorsement. It would give them a status like the General Medical Council. A new report has ruled out this possibility, for very good reasons [download local copy]. My involvement began with the publication in 2008 of a report on the Regulation of Practitioners of Acupuncture, Herbal Medicine, Traditional Chinese Medicine . That led to my post, A very bad report: gamma minus for the vice-chancellor. The report was chaired by the late Professor Michael Pittilo BSc PhD CBiol FIBiol FIBMS FRSH FLS FRSA, Principal and Vice-Chancellor of The Robert Gordon University, Aberdeen. The membership of the group consisted entirely of quacks and the vice -chancellor’s university ran a course in homeopathy (now closed). The Pittilo report recommended statutory regulation and "The threshold entry route to the register will normally be through a Bachelor degree with Honours". It ignored entirely the little problem that you can’t run a BSc degree in a subject that’s almost entirely devoid of evidence. It said, for example that acupuncturists must understand " yin/yang, 5 elements/phases, eight principles, cyclical rhythms, qi ,blood and body fluids". But of course there is nothing to "understand"! They are all pre-scientific myths. This “training dilemma” was pointed out in one of my earliest posts, You’d think it was obvious, but nonetheless the then Labour government seemed to take this absurd report seriously. In 2009 a consultation was held on the Pittilo report. I and many of my friends spent a lot of time pointing out the obvious. Eventually the problem was again kicked into the long grass. "”We enhance and safeguard the health of the public by ensuring that medicines and medical devices work and are acceptably safe." After much effort, I elicited an admission from the MHRA that there was no reason to think that any herbal concoctions were effective, and that there was nothing to prevent them from adding a statement to say so on the label. They just chose not to do so. That’s totally irresponsible in my opinion. See Why does the MHRA refuse to label herbal products honestly? Kent Woods and Richard Woodfield tell me. Over 300 herbal products have been registered under the THR scheme (a small percentage of the number of products being used). So far only one product of Tibetan medicine and one traditional Chinese medicine have been registered under THR. These are the only ones that can be sold legally now, because no herbs whatsoever have achieved full marketing authorisation -that requires good evidence of efficacy and that doesn’t exist for any herb. Eventually, in early 2014, the Tory-led government set up yet another body, "Herbal Medicines and Practitioners Working Group " (HMPWG). My heart sank when I saw its membership (Annex A.2). The vice-chair was none other that the notorious David Tredinnick MP (Con, Bosworth). It was stuffed with people who had vested interests. I wrote to the chair and to the few members with scientific credentials to put my views to them. But my fears were unfounded, because the report of the HMPWG was not written by the group, but by its chair only. David Walker is deputy chief medical officer and he had clearly listened. Here are some quotations. "This legislation effectively banned the importation and sale of large-scale manufactured herbal medicine products. This step severely limited the scope of some herbal practitioners to continue practising, particularly those from the Traditional Chinese Medicine (TCM) and Ayurvedic traditions." "At present under UK law it is permitted for a herbal practitioner to see individual patients, offer diagnoses and prepare herbal treatments on their own premises, as long as these preparations do not contain banned or restricted substances. This is unchanged by the Traditional Herbal Medicinal Products Directive. " Walker recognised frankly that there is essentially no good evidence that any herb, western or Chinese, works well enough to make an acceptable treatment. And importantly he, unlike Pittilo, realised that this precludes statutory regulation. "There are a small number of studies indicating benefit from herbal medicine in a limited range of conditions but the majority of herbal medicine practice is not supported by good quality evidence. A great deal of international, primary research is of poor quality. " "ts. Herbal medicine practice is therefore currently based upon traditional practice rather than science. It is difficult to differentiate good practice from poor practice on the basis of this evidence in a way that could establish standards for statutory regulation"
" . . . there is very limited understanding of the risks to patient safety from herbal medicines and herbal practice. A review of safety data was commissioned from HMAC as part of this review. This review identified many anecdotal reports and case studies but little systematically collected data. Most herbal medicine products have not been through the rigorous licensing process that is required of conventional pharmaceutical products to establish their safety and efficacy. Indeed, only a small proportion have even been subject to the less rigorous Traditional Herbal Registration (THR) process. " accreditation; and specific dangerous herbs have been banned under UK law. This has weakened the case for introduction of statutory regulation as a further safety measure. " Then Walker identified correctly the training dilemma. Although it seems obvious, this is a big advance for a government document. Degrees that teach nonsense are not good training: they are miseducation. "The third issue is the identification of educational standards for training practitioners and the benchmarking of standards for accrediting practitioners. With no good data on efficacy or safety, it is difficult for practitioners and patients to understand or quantify the potential benefits and risks of a proposed therapeutic intervention. Training programmes could accredit knowledge and skills in some areas including pharmacology and physiology, professional ethics and infection control but without a credible evidence base relating to the safety and effectiveness of herbal medicine it is hard to see how they could form the basis of accreditation in this field of practice. There are a number of educational university programmes offering courses in herbal medicine although the number has declined in recent years. Some of these courses are accredited by practitioner organisations which is a potential governance risk as the accreditation may be based on benchmarks established by tradition and custom rather than science. "The herbal medicine sector is in a dilemma" is Walker’s conclusion. they do now, with no further regulation, and accept that their practice is based on tradition and personal experience rather than empirical science. The logical consequence of adopting this form of practice is that we should take a precautionary approach in order to ensure public safety. The public should be protected through consumer legislation to prevent false claims, restricting the use of herbal products which are known to be hazardous to health"
The problem with this is, if course, is that although there is plenty of law, it’s rarely enforced : see Most alternative medicine is illegal Trading Standards very rarely enforce the Consumer Protection Regulations (2008) but Walker is too diplomatic to mention that fact. "The herbals sector must recognise that its overall approach (including the rationale for use of products and methods of treatment, education and training, and interaction with the NHS) needs to be more science and evidence based if in order to be established as a profession on the same basis as other groups that are statutorily regulated." In the short term nothing will happen. The main mistake has been avoided: there wil be no statutory regulation. The other options are (a) do nothing, or (b) go for accreditation of a voluntary register (AR) by the Professional Standards Authority for Health and Social Care (PSA). Walker ends up recommending the latter, but only after a lot more work (see pages 28-29 of report). Of particular interest is recommendation 5. "As a first step it would be helpful for the sector organisations to develop an umbrella voluntary register that could support the development of standards and begin to collaborate on the collection of safety data and the establishment of an academic infrastructure to develop training and research. This voluntary register could in due course seek accreditation from the Professional Standards Authority for Health and Social Care (PSA)." So it looks as though nothing will happen for a long time, and herbalists and TCM may end up with the utterly ineffectual PSA. After all, the PSA have accredited voluntary registers of homeopaths, so clearly nothing is too delusional for them. It’s very obvious that, unlike Walker, the PSA are quite happy to ignore the training dilemma. Good though this report is, by Department of Health standards, it omits some important points. And the unspeakably cruel practice of farming bears to collect bile is a direct consequence of TCM. The same arguments used in Walker’s report to deny statutory regulation of herbalism, would undoubtedly lead to denial of statutory regulation of chiropractors. The General Chiropractic Council was established in 1994, and has a status that’s the same as the General Medical Council. That was a bad mistake. The GCC has not protected the public, in fact it has acted as an advertising agency for chiropractic quackery. Perhaps Prof. Walker should be asked to review the matter. You can also read minutes of the HMPWG meetings (and here). But, as usual, all the interesting controversies have been sanitised. Edzard Ernst has also commented on this topic: Once again: the regulation of nonsense will generate nonsense – the case of UK herbalists. We all know that chiropractors feel pretty desperate, after their job has been revealed as baseless (much more information at ebm-first). Nonetheless it was very surprising when I was alerted by Twitter to the fact that the London Chiropractors were claiming to have been chosen by UCL as a "Centre of Excellence". That was the heading in the whole page devoted to crowing about this designation. The page, as it was on18th April, can be seen on freezepage.com. They even boast about our 21 Nobel prizewinners, as though they had endorsed chiropractic. 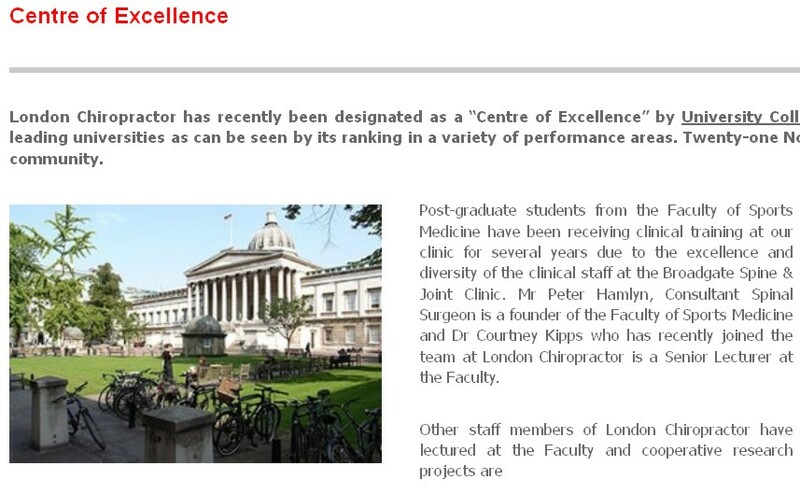 "London Chiropractor has recently been designated as a “Centre of Excellence” by University College London. The University is among the world’s leading universities as can be seen by its ranking in a variety of performance areas. Twenty-one Nobel prizewinners have come from the University’s community". "The designation of London Chiropractor as a Centre of Excellence is something that we are sincerely proud of. It distinguishes our clinic while providing impetus to carry on with our multi-disciplinary and evidence based treatment strategies while looking for new ways in which to improve on all aspects of our clinic at the same time and in a continuous manner." But chiropractic is undoubtedly in deep trouble, after more that 600 complaints were submitted to the General Chiropractic Council (GCC). The GCC was forced to renounce what has always been a central myth of chiropractic, the "subluxation". The fact that most of the complaints have been rejected has revealed huge deficiencies in the GCC (some of which it recently admitted). It also reveals the uselessness of the Council for Health Regulatory Excellence (CHRE).which is meant to supervise them. More details at quackometer, Chiropractors at War with their Regulator, the GCC. "The BCA sued Simon Singh personally for libel. In doing so, the BCA began one of the darkest periods in its history; one that was ultimately to cost it financially,"
Needless to say, chiropractors are trying to cash in on the Olympic games, sadly, with a little success. I suppose that invoking UCL. was part of that attempt. Like so many of chiropractors’ attempts to defend themselves, it misfired badly. The inspection of evidence that followed the attempt by the British Chiropractic Association (BCA) to sue Simon Singh showed that he was entirely justified to describe many of their treatments as “bogus” and “without a jot of evidence”. A quick email to the UCL authorities quickly determined that the claimed endorsement was not true. Attempting to access this page now leads to “page not found". The page vanished on Sunday 22nd April, and a near identical page for the Broadgate Spine and Joint Clinic had already vanished on Friday 20th April. While it is true that two surgeons from UCL’s Institute of Sports Medicine have worked in the same building, they neither use chiropractic nor endorse it. I’m assured that the alleged endorsement never happened. London Chiropractors won’t say where it came from. It seems that it was simply made up. I think that’s called a lie. I presume it is a sign of the desperation of chiropractors. It is true that all the undergraduate courses are in post-1992 universities, but the advance of quackademia is by no means limited to them. The teaching at St Bartholomew’s Hospital Medical School, one of the oldest, was pretty disgraceful for example, though after protests from their own students, and from me, it is now better, I believe. The first is via their HR departments, which are run by people who tend to be (I quote) "credulous and moronic" when it comes to science. The other main source is in teaching to medical students. The General Medical Council says that medical students must know something about alterantive medicine and that’s quite right, A lot of their patients will use it. The problem is that the guidance is shockingly vague . In many medical schools, the information that medical students get is quite accurate. At UCL and at King’s (London) I have done some of the familiarisation myself. In other good medical schools, the students get some shocking stuff. St Bartholomew’s Hospital medical School was one example. Edinburgh University was another. But there is one Russell group university where alternative myths are propagated more than any other that I know about. That is the University of Southampton. In general, Southampton is a good place, I worked there for three years myself (1972 – 1975). The very first noise spectra I measured were calculated on a PDP computer in their excellent Institute of Sound and Vibration Research, before I wrote my own programs to do it. Notice the usual euphemisms ‘complementary’ and ‘integrated’ in the title: the word ‘alternative’ is never used. This sort of word play is part of the bait and switch approach of alternative medicine. The unit is quite big: ten research staff, four PhD students and two support staff It is headed by George Lewith. Teaching about alternative medicine to Southampton medical students. The whole medical class seems to get quite a lot compared with other places I know about. That’s 250 students (210 on the 5-year course plus another 40 from the 4-year graduate-entry route). Year 1: Lecture by David Owen on ‘holism’ within the Foundation Course given to all 210 medical students doing the standard (5-year) course. Year 2: Lecture by Lewith (on complementary medicine, focusing on acupuncture for pain) given within the nervous systems course to the whole medical student year-group (210 students). Year 3 SBOM (scientific basis of medicine) symposium: The 3-hour session (“Complementary or Alternative Medicine: You Decide”). I’m told that attendance at this symposium is often pretty low, but many do turn up and all of them are officially ‘expected’ to attend. There is also an optional CAM special study module chosen by 20 students in year 3, but also a small number of medical students (perhaps 2 – 3 each year?) choose to do a BMedSci research project supervised by the CAM research group and involving 16-18 weeks of study from October to May in Year 4. The CAM research group also supervise postgraduate students doing PhD research. As always, a list of lectures doesn’t tell you much. What we need to know is what’s taught to the students and something about the people who teach it. The other interesting question is how it comes about that alternative medicine has been allowed to become so prominent in a Russell group university. It must have support from on high. In this case it isn’t hard to find out where it comes from. Here are some details. David Owen is not part of Lewith’s group, but a member of the Division of Medical Education headed by Dr Faith Hill (of whom, more below). He’s one of the many part-time academics in this area, being also a founder of The Natural Practice . Owen is an advocate of homeopathy (a past president of the Faculty of Homeopathy). Homeopathy is, of course, the most barmy and discredited of all the popular sorts of alternative medicine. Among those who have discredited it is the head of the alt med unit, George Lewith himself (though oddly he still prescribes it). And he’s also a member of the British Society of Environmental Medicine (BSEM). That sounds like a very respectable title, but don’t be deceived. It is an organisation that promotes all sorts of seriously fringe ideas. All you have to do is notice that the star speaker at their 2011 conference was none other than used-to-be a doctor, Andrew Wakefield, a man who has been responsible for the death of children from measles by causing an unfounded scare about vaccination on the basis of data that turned out to have been falsified. There is still a letter of support for Wakefield on the BSEM web site. The BSEM specialises in exaggerated claims about ‘environmental toxins’ and uses phony allergy tests like kinesiology and the Vega test that misdiagnose allergies, but provide en excuse to prescribe expensive but unproven nutritional supplements, or expensive psychobabble like "neuro-linguistic programming". Other registered "ecological physicians" include the infamous Dr Sarah Myhill, who, in 2010, was the subject of a damning verdict by the GMC, and Southampton’s George Lewith. If it is wrong to expose medical students to someone who believes that dose-response curves have a negative slope (the smaller the dose the bigger the effect -I know, it’s crazy), then it is downright wicked to expose students to a supporter of Andrew Wakefield. David Owen’s appearance on Radio Oxford, with the indomitable Andy Lewis appears on his Quackometer blog. Lewith is a mystery wrapped in an enigma. He’s participated in some research that is quite good by the (generally pathetic) standards of the world of alternative medicine. In 2001 he showed that the Vega test did not work as a method of allergy diagnosis. "Conclusion Electrodermal testing cannot be used to diagnose environmental allergies", published in the BMJ . [download reprint]. In 2003 he published "A randomized, double-blind, placebo-controlled proving trial of Belladonna 30C” [download reprint] that showed homeopathic pills with no active ingredients had no effects: The conclusion was "”Ultramolecular homeopathy has no observable clinical effects" (the word ultramolecular, in this context, means that the belladonna pills contained no belladonna). What i cannot understand is that, despite his own findings, his private practice continues to prescribe the Vega machine and continues to prescribe homeopathic pills. And he continues to preach this subject to unfortunate medical students. Lewith is also one of the practitioners recommended by BSEM. He’s a director of the "College of Medicine". And he’s also an advisor to a charity called Yes To Life. (see A thoroughly dangerous charity: YesToLife promotes nonsense cancer treatments). More details of the teaching team here. There is not a single sceptic among them, so the students don’t get a debate, just propaganda. variety of active as well as inactive treatments." This sort of critical thinking is conspicuously absent from this (and all the other) Southampton handouts. The handout is a superb example of bait and switch: No nonsense about infant colic, innate energy or imaginary subluxations appears in it. Acupuncture is another interesting case because there is quite a lot of research evidence, in stark contrast to the rest of traditional Chinese medicine, for which there is very little research. There is a powerpoint show by Susan Woodhead (though it is labelled British Acupuncture Council). The message is simple and totally uncritical. It works. In fact there is now a broad consensus about acupuncture. (1) Real acupuncture and sham acupuncture have been found to be indistinguishable in many trials. This is the case regardless of whether the sham is a retractable needle (or even a toothpick) in the "right" places, or whether it is real needles inserted in the "wrong" places. The latter finding shows clearly that all that stuff about meridians and flow of Qi is sheer hocus pocus. It dates from a pre-scientific age and it was wrong. (2) A non-blind comparison of acupuncture versus no acupuncture shows an advantage for acupuncture. But the advantage is usually too small to be of any clinical significance. In all probability it is a placebo effect -it’s hard to imagine a more theatrical event than having someone in a white coat stick long needles into you, like a voodoo doll. Sadly, the placebo effect isn’t big enough to be of much use. Needless to say, none of this is conveyed to the medical students of Southampton. Instead they are shown crude ancient ideas that date from long before anything was known about physiology as though they were actually true. These folks truly live in some alternative universe. Here are some samples from the acupuncture powerpoint show by Susan Woodhead. Well this is certainly a "different diagnostic language", but no attempt is made to say which one is right. In the mind of the acupuncurist it seems both are true. It is a characteristic of alternative medicine advocates that they have no difficulty in believing simultaneously several mutually contradictory propositions. As a final exmple of barminess, just look at the acupuncture points (allegedly) on the ear The fact that it is a favoured by some people in the Pentagon as battlefield acupuncture, is more reminiscent of the mad general, Jack D. Ripper, in Dr Strangelove than it is of science. There is an equally uncritical handout on acupuncture by Val Hopwood. It’s dated March 2003, a time before some of the most valuable experiments were done. Modern techniques: These include hybrid techniques such as electro-acupuncture . . . and Ryadoraku [sic] therapy and Vega testing. Vega testing!! That’s been disproved dozens of times (not least by George Lewith). And actually the other made-up nonsense is spelled Ryodoraku. It’s true that there is a short paragraph at the end of the handout headed "Scientific evaluation of acupuncture" but it doesn’t cite a single reference and reads more like excuses for why acupuncture so often fails when it’s tested properly. Homeopathy. Finally a bit about that most boring of topics, the laughable medicine that contains no medicine, homeopathy. Caroline Eyles is a member for the Society of Homeopaths, the organisation that did nothing when its members were caught out in the murderous practice of recommending homeopathy for prevention of malaria. The Society of Homeopaths also endorses Jeremy Sherr, a man so crazy that he believes he can cure AIDS and malaria with sugar pills. The homeopathy handout given to the students has 367 references, but somehow manages to omit the references to their own boss’s work showing that the pills are placebos. The handout has all the sciencey-sounding words, abused by people who don’t understand them. "The remedy will be particularly effective if matched to the specific/particular characteristics of the individual (the ‘totality’ of the patient) on all levels, including the emotional and mental levels, as well as just the physical symptoms. ‘Resonance’ with the remedy’s curative power will then be at it’s [sic] best." "increasing clinical research confirms it’s [sic] clinical effectiveness in treating patients, including babies and animals (where a placebo effect would be hard to justify)." Anyone who has to rely on the utterly discredited Jacques Benveniste as evidence is clearly clutching at straws. What’s more interesting about this slide the admission that "reproducibility is a problem -oops, an issue" and that RCTs (done largely by homeopaths of course) have "various methodological flaws and poor external validity". You’d think that if that was the best that could be produced after 200 yours, they’d shut up shop and get another job. But, like aging vicars who long since stopped believing in god, but are damned if they’ll give up the nice country rectory, they struggle on, sounding increasingly desperate. How have topics like this become so embedded in a medical course at a Russell group university? The details above are a bit tedious and repetitive. It’s already established that hardly any alternative medicine works. Don’t take my word for it. Check the web site of the US National Center for Complementary and Alternative Medicine (NCCAM) who, at a cost of over $2 billion have produced nothing useful. A rather more interesting question is how a good university like Southampton comes to be exposing its medical students to teaching like this. There must be some powerful allies higher up in the university. In this case it’s pretty obvious who thay are. Professor Stephen Holgate MD DSc CSc FRCP FRCPath FIBiol FBMS FMed Sci CBE has to be the primary suspect, He’s listed as one of Southampton’s Outstanding Academics. His work is nothing to do with alternative medicine but he’s been a long term supporter of the late unlamented Prince of Wales’ Foundation, and he’s now on the advisory board of it’s successor, the so called "College of Medicine" (for more information about that place see the new “College of Medicine” arising from the ashes of the Prince’s Foundation for Integrated Health, and also Don’t be deceived. The new “College of Medicine” is a fraud and delusion ). His description on that site reads thus. "Stephen Holgate is MRC Clinical Professor of Immunopharmacology at the University of Southampton School of Medicine and Honorary Consultant Physician at Southampton University Hospital Trust. He is also chair of the MRC’s Populations and Systems Medicine Board. Specialising in respiratory medicine, he is the author of over 800 peer-reviewed papers and contributions to scientific journals and editor of major textbooks on asthma and rhinitis. He is Co-Editor of Clinical and Experimental Allergy, Associate Editor of Clinical Science and on the editorial board of 25 other scientific journals." Clearly a busy man. Personally I’m deeply suspicious of anyone who claims to be the author of over 800 papers. He graduated in medicine in 1971, so that is an average of over 20 papers a year since then, one every two or three weeks. I’d have trouble reading that many, never mind writing them. Holgate’s long-standing interest in alternative medicine is baffling. He’s published on the topic with George Lewith, who, incidentally, is one of the directors of the "College of Medicine".. It may be unkind to mention that, for many years now, I’ve been hearing rumours that Holgate is suffering from an unusually bad case of Knight starvation. The Division of Medical Education appears to be the other big source of support for. anti-scientific medicine. That is very odd, I know, but it was also the medical education people who were responsible for mis-educating medical students at. St. Bartholomew’s and at Edinburgh university. Southampton’s Division of Medical Education has a mind-boggling 60 academic and support staff. Two of them are of particular interest here. Faith Hill is director of the division. Her profile doesn’t say anything about alternative medicine, but her interest is clear from a 2003 paper, Complementary and alternative medicine: the next generation of health promotion?. The research consisted of reporting anecdotes from interviews of 52 unnamed people (this sort of thing seems to pass for research in the social sciences). It starts badly by misrepresenting the conclusions of the House of Lords report (2000) on CAM. Although it comes to no useful conclusions, it certainly shows a high tolerance of nonsensical treatments. Chris Stephens is Associate Dean of Medical Education & Student Experience. His sympathy is shown by a paper he wrote In 2001, with David Owen (the homeopath, above) and George Lewith: Can doctors respond to patients’ increasing interest in complementary and alternative medicine?. Two of the conclusions of this paper were as follows. "Doctors are training in complementary and alternative medicine and report benefits both for their patients and themselves"
Well, no actually. It wasn’t true then, and it’s probably even less true now. There’s now a lot more evidence and most of it shows alternative medicine doesn’t work. "Doctors need to address training in and practice of complementary and alternative medicine within their own organisations"
Yes they certainly need to do that. 4 July 2011. A correspondent has just pointed out that Chris Stephens is a member of the General Chiropractic Council. The GCC is a truly pathetic pseudo-regulator. In the wake of the Simon Singh affair it has been kept busy fending off well-justified complaints against untrue claims made by chiropractors. The GCC is a sad joke, but it’s even sadder to see a Dean of Medical Education at the University of Southampton being involved with an organisation that has treated little matters of truth with such disdain. A rather unkind tweet from (ex)-chiropractor @RichardLanigan. Chiropractors are getting very touchy indeed, all over the world. And no wonder, because their claims are being exposed as baseless as never before, in the wake of their attempts to stifle criticism by legal action.. In March, Shaun Holt appeared on Breakfast TV in New Zealand. Holt has done a lot of good work on TV in debunking some of the preposterous claims made by quacks. See him on YouTube. This time he talked about chiropractic. Here is the video. One could argue that he was over generous to chiropractic, especially when talking about their effectiveness in treating low back pain. He said, quite rightly, that chiropractors are no better than physiotherapists at treating low back pain. But a recent trial suggests that neither are much good. “A randomised controlled trial of spinal manipulative therapy in acute low back pain” (Juni et al., 2009 in the BMJ; see also coverage in Pulse). This trial compared standard care with standard care plus spinal manipulative therapy (SMT). The results were negative, despite the fact that this sort of A + B vs B design is inherently biassed in favour of the treatment (see A trial design that generates only ”positive” results, Ernst & Lee 2008, Postgrad Med J.). "SMT was performed by a specialist in manual medicine, chiropractice and rheumatology (GH), a specialist in physical medicine (DV) or an osteopath (RvB), all proficient in SMT." "Conclusions: SMT is unlikely to result in relevant early pain reduction in patients with acute low back pain." Admittedly, the trial was quite small (104 patients, 52 in each group) so it will need to be confirmed. but the result is entirely in line with what we knew already. It also adds to the evidence that the recommendation by NICE of SMT by chiropractors constitutes their biggest failure ever to assess evidence properly. If NICE don’t amend this advice soon, they are in danger of damaging their hitherto excellent record. Despite the moderate tone and accuracy of what Holt said on TV, the New Zealand Chiropractors’ Association made a formal complaint. That is what they like to do, as I learned recently, to my cost. It is so much easier than producing evidence. Quite absurdly the New Zealand Broadcasting Standards Authority (BSA) has upheld some of the complaints. Their judgement can be read here. The BSA consists of four people, two lawyers and two journalists. So not a trace of scientific expertise among them. Having people like that judging the claims of chiropractors makes as much sense as having them judged by Mr Justice Eady. They seem to be the sort of people who think that if there is a disagreement, the truth must lie half-way between the opposing views. One of the BSA members, Tapu Misa, has used her newspaper column to quote approvingly the views of the notorious Dr Mercola web site on flu prevention “Your best defence, it says, is to eat right, get lots of sleep, avoid sugar and stress, load up on garlic, Vitamin D and krill oil”. (Snake oil is said to be good too.) There are some odd attitudes to science in some of her other columns too (e.g. here and here). Not quite the person to be judging the evidence for and against chiropractic, I think. In fact the TV show in question was more than fair to chiropractors. It adopted the media’s usual interpretation of fair and balanced: equal time for the flat earthers. A Chiropractor was invited to reply to Holt’s piece. Here he is. The chiropractor, Doug Blackbourn, started very plausibly, though a tendency to omit every third syllable made transcription hard work. He established that if you cut yourself you get better (without any help). He established that nerves run down the spinal cord. So far, so good. But then he quickly moved on to the usual flights of fancy. "We have two premises. The body heals itself and the nervous system runs the body. Now the nervous system runs the body, travels down through the spinal cord so chiropractic is not based on the belief that, you know, energy flows, it’s based on the fact that your nervous system runs the body and [inaudible] affects the overall health of the body"
This statement is totally vague. It has nothing whatsoever to do with the main question, can chiropractors do anything useful. It is sheer flannel. We’re seeing people, heck, diabetes. I had a quadriplegic come in one time for adjustment, we’ve got stroke people, we’ve got all sorts of conditions. We’re not treating the condition, We’re allowing, checking the spine to see if there’s any interference there that will slow the body down"
“Interference”? “slowing the body down”? These are utterly meaningless phrases that simply serve to distract from the only question that matters. "Chiropractice is the most safest [sic] profession to go to to get your spine adjusted"
Hmm I thought it was the only job that uses the word ‘adjustment’. Worst of all was his response to a question about asthma. Presenter: "So chiropractors are not out there claiming they will cure asthma for example?". Chiropractor: "No"
This is simply untrue, both in New Zealand and in the UK. For a start, just look at what Blackbourn’s own web site says about asthma. "The challenge, of course, with allergy and asthma medication is there is no end-point. There is no cure. Asthma and allergies, for the most part, are lifelong conditions requiring lifelong medication. Might there be a better way, an alternative solution? Enter chiropractic care. Chiropractic health care, with its unique comprehensive approach, is able to offer positive benefit to a variety of conditions and ailments. In the case of allergies and asthma, these “hypersensitivity conditions” may respond well to therapy designed to normalize the body’s flow of nerve signals. To use a metaphor, chiropractic treatment removes roadblocks to the body’s natural healing abilities. Restoring these imbalances may help reduce such hypersensitivity reactions." "As a Doctor of Chiropractic, Dr. Doug Blackbourn . . ."
But the qualifications of “Dr” Blackbourn are B.App.Sc (Chiro) M.N.Z.C.A , the same as those of “Dr” Brian Kelly. After a performance like this, perhaps someone should submit a complaint to the New Zealand Broadcasting Standards Authority. After all, I notice that they have dismissed complaints from one chiropractor, Sean Parker, after a TV programme looked at the business practices of his private chiropractic practice, The Spinal Health Foundation. Perhaps the BSA understands business better than it understands science. Is chiropractic crumbling in New Zealand? The New Zealand College of Chiropractic featured in my editorial in the New Zealand Medical Journal, and in the fallout from that article, It’s principle, “Dr” Brian Kelly (B App Sci (Chiro)) seems to be getting desperate. His college is now canvassing for recruits in Canada. They are promised all the woo. Perhaps Canada is a good place to recruit, gven the $500 million class action being brought against chiropractors in Canada, after Sandra Nette became tetraplegic immediately after a chiropractor manipulated her neck, Canadian chiropractors must be looking for somewhere to hide. Stuff and Nonsense. jdc described this story at the time the complaint was lodged. Shaun Holt’s own blog follows the action. New Zealand Doctor covers the story. In July 2008 I wrote an editorial in the New Zealand Medical Journal (NZMJ), at the request of its editor. The title was Dr Who? deception by chiropractors. It was not very flattering and it resulted in a letter from lawyers representing the New Zealand Chiropractic Association. Luckily the editor of the NZMJ, Frank Frizelle, is a man of principle, and the legal action was averted. It also resulted in some interesting discussions with disillusioned chiropractors that confirmed one’s worst fears. Not to mention revealing the internecine warfare between one chiropractor and another. This all occurred before the British Chiropractic Association sued Simon Singh for defamation. The strength of the reaction to that foolhardy action now has chiropractors wondering if they can survive at all. The baselessness of most of their claims has been exposed as never before. No wonder they are running scared. The whole basis of their business is imploding. I’d found the quotation, and the reference, in Ernst’s 2005 article, The value of Chiropractic, but at the time I couldn’t find the Journal of Quality Healthcare. I did find the same article on the web. At least the article had the same title, the same author and the same quotation. But after finding, and reading, the article, I neglected to change the reference from J Quality Health Care to http://skepticreport.com/sr/?p=88. I should have done so and for that I apologise. When I asked Ernst about the Journal of Quality Healthcare, he couldn’t find his copy of the Journal either, but he and his secretary embarked on a hunt for it, and eventually it was found. It turns out that Journal of Quality Healthcare shut down in 2004, without leaving a trace on the web, or even in the British Library. It was replaced by a different journal, Patient Safety and Quality Healthcare (PSQH) A reprint was obtained from them. It is indeed the same as the web version that I’d read, and it highlighted the quotation in question. The reprint of the original article, which proved so hard to find, can be downloaded here. "Sixty-two clinical neurologists from across Canada, all certified members of the Royal College of Physicians and Surgeons, issued a warning to the Canadian public, which was reported by Brad Stewart, MD. The warning was entitled Canadian Neurologists Warn Against Neck Manipulation. The final conclusion was that endless non-scientific claims are being made as to the uses of neck manipulation(Stewart, 2003). They need to be stopped. The public should be informed that chiropractic manipulation is the number one reason for people suffering stroke under the age of 45." I have often condemned the practice of citing papers without reading them (it is, of course, distressingly common), so I feel bad about this, though I had in fact read the paper in question in its web version. I’m writing about it because I feel one should be open about mistakes, even small ones. I’m also writing about it because one small section of the magic medicine community seems to think they have nailed me because of it. David Owen, the New Zealand chiropractor, wrote to the editor of the NZMJ, thus. The quote [in question] is the public should be informed that chiropractic manipulation is the number one reason for people suffering stroke under the age of 45. This would not be an issue at all if he had admitted it came from a blog site— but I guess the link would have eroded the credibility of the quote. Colquhoun ‘s belief that my forwarding this complaint is me “resorting to threats” is the final nail in the coffin. If he had any leg to stand on where is the threat? This may seem pedantic but it surely reflects a serious ethical breach. Is it acceptable to make up a reference to try and slip any unsupported statement into a “scientific” argument and thereby give it some degree of credibility? Incidentally, at the end of the article, conflicts of interest are listed as none. As Colquhoun is a Professor of Pharmacology and much of his research funding no doubt comes from the pharmaceutical industry how can he have no conflict of interest with therapies that do not advocate the use of drugs and compete directly against the billions spent on pain medications each year? If I may quote Colquhoun himself in his defence of his article (Journal of the New Zealand Medical Association, 05-September-2008, Vol 121 No 1281) I’ll admit, though, that perhaps ‘intellect’ is not what’s deficient in this case, but rather honesty. I spend a lot of my spare time, and a bit of my own money, in an attempt to bring some sense into the arguments. The alternative medicine gurus make their livings (in some cases large fortunes) out of their wares. So who has the vested interest? Does chiropractic actually cause stroke? My assessment at the moment, for what it’s worth, is that there are some pretty good reasons to suspect that neck manipulation can be dangerous, but it seems that serious damage is rare. Chiropractic is entirely discredited, whether or not it may occasionally kill people. I had an enquiry about this problem also from my old friend George Lewith. I told him what had happened. Soon after this, a complaint was sent to Tim Perry and Jason Clarke, UCL’s Director and Deputy Director of Academic Services. The letter came not from Lewith or Owen, but from Lionel Milgom. Milgrom is well known in the magic medicine community for writing papers about how homeopathy can be “explained” by quantum entanglement. Unfortunately for him, his papers have been read by some real physicists and they are no more than rather pretentious metaphors. See, for example, Danny Chrastina’s analysis, and shpalman, here. Not to mention Lewis, AP Gaylard and Orac. Professor Colquhoun is well-known for writing extensively and publicly excoriating many forms of complementary and alternative medicine, particularly with regard to the alleged unscientific nature and unethical behaviour of its practitioners. Professor Colquhoun is also a voluble champion for keeping the libel laws out of science. While such activities are doubtlessly in accord with the venerable Benthamite liberal traditions of UCL, I am quite certain hypocrisy is not. And though Professor Colquhoun has owned up to his error, as the NZMJ’s editor implies, it leaves a question mark over his credibility. As custodians of the college’s academic quality therefore, you might care to consider the possible damage to UCL’s reputation of perceived professorial cant; emeritus or otherwise. So, as we have seen, the quotation was correct, the reference was correct, and I’d read the article from which it came I made a mistake in citing the original paper rather than the web version of the same paper.. I leave it to the reader to judge whether this constitutes a "serious ethical breach", whether I’d slipped in an "unsupported statement", and whether it constitutes "hypocrisy"
It so happens that no sooner was this posted than there appeared Part 2 of the devastating refutation of Lionel Milgrom’s attempt to defend homeopathy, written by AP Gaylard. Thanks to Mojo (comment #2) for pointing this out. Today, 29 July 2009, a large number of magazines and blogs will publish simultaneously Simon Singh’s article. The Guardian was forced to withdraw it, but what he said must be heard (even if the word ‘bogus’ is now missing). This is an edited version if the article in the Guardian that resulted in the decision of the British Chiropractic Association to sue Singh for libel. That decision was bad for Singh, though its effects could yet be good for the rest of the world, Firstly the decision to use law rather than rational argument stands a good chance of destroying chiropractic entirely because its claims have now come under scrutiny as never before, and they have been found wanting. Secondly, the support for Singh has been so enormous that there must now be a good chance of getting the UK’s iniquitous laws about defamation changed. I’d rather have reproduced the original article in its entirety, but this bowdlerised version still presents the case very strongly (and the unedited version appears here and here). “If spinal manipulation were a drug with such serious adverse effects and so little demonstrable benefit, then it would almost certainly have been taken off the market“. It is the job of NICE to evaluate critically that sort of thing, which makes it all the odder that the NICE guidance group, very unusually, failed to assess properly the evidence for chiropractic. Resignation of Pain Society president. While we are on the topic of chiropractic, my comment, The hidden cost of endorsing voodoo, appeared at last on the BMJ article about NICE’s low back pain guidance. The thread came back to life after the British Pain Society voted out its president, Paul Watson, a physiotherapist who was a member of the group that wrote the guidance. Some of the links Links to some of the many repostings of Singh’s article today are aggregated at Sense about Science. There where over 200 in a single day. The British Chiropractic Association tried to suppress criticism, but they clearly don’t understand the web. “An intrepid, ragged band of bloggers. Chiropractors may regret choosing to sue Simon Singh, springing online scientists into action”. Ben Goldacre has summed up the reaction of the blogosphere with characteristically fine style in the Guardian. Ragged? Moi? The blog version (with links) is here. On 17th June 2009, 15 months after Singh’s article was published, the British Chiropractic Association (BCA) has finally produced its evidence (though only after enormous pressure from bloggers [download as pdf]..
Jack of Kent has already made some comments from the legal point of view. As expected, the list of references they give is truly pathetic, The list of 29 references has nine about infantile colic, four about asthma (two of which refer to osteopathy not chiropractic). three about the safety of chiropractic (a contentious matter but not the point here) and three about the safety of non-steroidal anti-inflammatory drugs (an important matter but utterly irrelevant here). Let’s look at the papers about colic. Most are in obscure alternative medicine journals, not easily available, but the BCA’s own synopsis is sufficient for now. Klougart N, Nilsson N and Jacobsen J (1989) Infantile Colic Treated by Chiropractors: A Prospective Study of 316 Cases, J Manip Physiol Ther,12:281-288. [ download thr reprint]. As evidence it is about as useless as the infamous Spence study so beloved of homeopaths. There was no control group at all. It simply follows 316 babies and found that most of them eventually got better. Well, they do, don’t they? It is a sign of the pathetic standard of research in chiropractic that anyone should think this paper worth mentioning at all. Mercer, C. and Nook, B. in the Proceedings of the 5th Biennial Congress of the World Federation of Chiropractic (1999) (so no peer review, for what that is worth). “Resolution of symptoms [of infantile colic] in 93% of infants treated with spinal manipulation”.. This sounds as useless as Klougart et al. Why only 93% one wonders? Every parent knows that 100 percent of babies stop crying eventually. I expect that all that means is that dimethicone doesn’t work either. Hayden & Mullinger (2006) Complementary Ther. clin. Prac. “This preliminary study suggested that cranial osteopathic treatment can benefit infants with colic”. So. (a) preliminary and (b) not chiropractic. Hipperson AJ (2004) Clinical Chiropractic 11, 122 – 129. A report of two case studies, so essentially worthless as evidence The journal isn’t even listed in Pubmed. Browning M. Miller, J. Clinical Chiropractic (2008) 11, 122—129 [download pdf] Comparison of the short-term effects of chiropractic spinal manipulation and occipito-sacral decompression in the treatment of infant colic: A single-blinded, randomised, comparison trial. This paper just compared two different chiropractic methods. It shows that both are equally effective, or equally plausibly, both are equally ineffective. Leach RA (2002) J Manip Physiol Ther, 25, 58 -62. Merely two case reports and they refer to usie of a mechanical device, not the usual chiropractic manipulation. Miller J (2007) Clinical Chiropractic 10, 139—146 Cry babies: A framework for chiropractic care [download pdf]. No evidence at all here. It isn’t a research paper. Nilsson N. 1985 Eur J Chiropr 33, 264 – 255 Infantile colic and chiropractic. “Respondents to a questionnaire revealed that 91% of of infants improved after 2 – 3 manipulations”. Again, no controls. So, babies stop crying, eventually. Conclusion Chiropractic spinal manipulation is no more effective than placebo in the treatment of infantile colic. This study emphasises the need for placebo controlled and blinded studies when investigating alternative methods to treat unpredictable conditions such as infantile colic. More on this dishonest selectivity can be found at Holfordwatch. No doubt there will soon be more analyses of what passes, in the eyes of the BCA, for evidence, The nine papers they cite for colic are truly pathetic. Not a single one of them amounts to anything that would be recognised as evidence in the real world. And papers that do provide real evidence are not mentioned. As always, the blogs provided a very fast response to a document that appeared only late last night. And, as always, these unpaid people, working in their spare time, have done a far better job than the suits at the BCA (or NICE). “A Review of The BCA’s Evidence for Chiropractic”. Martin on The Lay Scientist. “The BCA have no evidence that chiropractic can help with ear infections” on Gimpy’s blog. “Examining the BCA’S ‘Plethora’ of Evidence”. Unity, at Ministry of Truth. “Careful, BCA, you might slip a disk. The British Chiropractic Association may need to hire a chiropractor to work on themselves: they’re shoveling so hard they’re likely to hurt their backs.” In the US magazine, Discover. “British Chiropractic Association (BCA) demonstrate what evidence-based medicine isn’t” at Holfordwatch. This one shows nicely how the BCA fail to apply their own standard of evidence, based on Sackett et al. (1996). Laurie Taylor says it all. Could this bit (dated 18 June) in Laurie Taylor’s saga of the University of Poppleton possibly have been inspired by the Singh affair? Our campus burst into colour last week as members of the Department of Aromatherapy, led by Professor Gwendolyn Frisson, paraded round the former administrative block happily waving bunches of wild carrot, devil’s claw, cinnamon leaf and lime blossom. What sparked the herbal celebration was the news of a full retraction from the journalist on the Poppleton Evening News who had described the department in print as “a hotchpotch of untestable propositions and unproven medical interventions”. The journalist in question, Simeon Rainbow, explained in his published retraction that he’d had time to reflect on the department’s reaction to his original article and now fully recognised that there was no better way of deciding upon the scientific validity of practices such as aromatherapy than by threatening anyone who denied such validity with an enormously costly libel action. Professor Frisson said that she welcomed the retraction. She would now be able to return with renewed enthusiasm to her research on the beneficial effects of grated angelica root on patients with advanced encephalitis. A flood of complaints against chiropractors has arrived at the General Chiropractic Council (GCC) in the wake of the British Chiropractic Association (BCA) v Singh affair. It is really rather beautiful that people have put some such enormous effort into writing complaints for no gain to themselves. Naturally I shall take up this offer. If the same offer is made to everyone who complained (must be approaching 600), the legal fees incurred by the GCC would presumably be enough to bankrupt them. No wonder they are wriggling. In quangos like the GCC, complaints don’t necessarily get considered at all. First they go to an investigating committee (IC) which has to decide if there is a ‘case to answer’. Now the GCC wants that criterion to be changed to ‘realistic prospect of success’. Given the GCC’s attitude to evidence it is hard to imagine that any complaint will have a ‘realistic prospect of success’. The second idea is even more grotesque. The GCC want to be able to dismiss without consideration rafts of complaints where in their opinion, referral to the Professional Conduct Committee (PCC) ‘is not required in the public interest. Or, more likely, not required in the interests of the GCC. Will the Privy Council acquiesce in this disgraceful attempt to evade complaints? Wel, until January 2008, Graham Donald was a senior civil Servant at the Privy Council bit he now works for the GCC. That must help. What on earth is that meant to mean? One hopes that Trading Standards officers are too smart to be taken in by weasel words like that. The attitude of the GCC to evidence is amply illustrated by the fact that they have said that the rather crude myths known as craniosacral therapy and applied kinesiology fall within their definition of evidence-based care. Any organisation that can say that is clearly incompetent. Peter Dixon is a chiropractor. He is chair of the General Chiropractic Council (GCC). He was also a member of the hotly-disputed NICE low back pain guidance group that endorsed (you guessed it) the use of chiropractic, a decision that has led to enormous criticism of the standards of the National Institute of health and Clinical Excellence (NICE). As a consequence largely of the decision of the British Chiropractic Association (BCA) to sue Simon Singh for defamation, there has been an unprecedented interest taken in the claims made by chiropractors in general. Peter Dixon has a problem because something like 600 individual complaints about unjustified health claims have been sent to the GCC. Even when a web site does not claim to be able to benefit things like asthma and colic, a phone call may reveal that claims are made in private (one of the many complaints to the GCC concerns such behaviour by two practices belonging to, ahem, Peter Dixon Associates). The crucial question is, as always, one of evidence. The BCA claim to have a plethora of evidence for their claims, but they have been strangely reluctant to produce it. In fact evidence is cited on the “Your first visit” page on Dixon’s site. At the bottom we see “How effective is Chiropractic?”. But hang on. If we look at the paper, Meade et al., 1990 [download reprint], we see that Figure 2 looks like this. Several things jump out. First, the Oswestry disability index scale runs for 0 to 100, but scores are plotted only from 0 to 35, so the size of the effects are exaggerated. Second, there are no error bars on the points. Third there is essentially no advantage for chiropractic at all when all patients are taken together (top graph). Fourth, and most important, the patients who were followed up for two years (bottom graph) seem to show a slight advantage for chiropractic but on average, the effect is 7 percent (on the 100 point scale, NOT 70 percent as claimed on the web site of Peter Dixon Associates. What sort of mistake was made? The abstract of the paper itself says “A benefit of about 7% points on the Oswestry scale was seen at two years.” How did this become “improved by 70% more”? It could have been simple a typographical error, but that seems unlikely, Who’d boast about a 7% improvement? Perhaps it is a question of relative versus absolute change. The Figure does not show the actual scores on the 100 point scale, but rather the change in score, relative to a questionnaire given just before starting treatment. If we look at the lower part of the Figure, restricted to those patients who stayed with the trail for 2 years (by this time 28% of the patients had dropped out), we see that there is a reduction in score (improvement) of about 10 points on the 100 point scale with hospital treatment (not a very impressive response). The improvement with those sent to private chiropractic clinics was about seven points bigger. So a change from 10 to 17 is a 70 percent change. What’s wrong with that? What’s wrong is that it is highly misleading, as relative changes often are. Imagine that the hospital number had been 7 points and the chiropractic number had been 14 (both out of 100). That would mean that both treatments had provided very modest benefits to the patients. Would it then be fair to describe the chiropractic patients as have improved by 100 percent more than the hospital patients, when in fact neither got much benefit? Of course it would not. To present the results in this way would be highly deceptive. Put another way, a 70% increase in a trivial effect is still pretty trivial. That isn’t all either. The paper has been analysed in some detail on the ebm-first site. The seven point difference on a 100 point scale, though it may be real, is too small to be ‘clinically significant’ In other words the patient would scarcely notice such a small change. Another problem lies in the nature of the comparison. Patients were, quite properly, allocated at random to chiropractic or to to hospital treatment. BUT the comparion was very from blind. one group was treated in hospital. The other group was sent to private chiropractic clinics. The trivial 7 point difference could easily be as much to do with the thickness of the carpets rather than any effect of spinal manipulation. What this paper really tells you is that neither treatment is very effective and that there is little to choose between them. It is really most unfortunate that the chairman of the GCC should show himself to be so careless about evidence at a time when the evidence for the claims of chiropractors is under inspection as never before. It does not add to their case for criticising Simon Singh and it does not add to one’s confidence in the judgement of the NICE guidance group. The Pain Society revolt. A letter has been sent from several distinguished members of the British Pain Society to its President and Council. “We are led by a physiotherapist! A Professor who cannot even interpret straight forward evidence when it is presented to him on a plate. The battle for freedom of speech is under way. Simon Singh is a great science writer and communicator. He is author of The Big Bang, The Code Book, Fermat’s Last Theorem, and, with Edzard Ernst, Trick or Treatment. They are superb books (buy from Amazon). When Singh had the temerity to express an honest opinion, based on the evidence, about that very curious branch of alternative medicine known as chiropractic, the British Chiropractic Association sued Singh for defamation.This was their substitute for producing evidence for their bizarre claims. The legal aspects of the case are being described by the lawyer who writes under the name of Jack of Kent. He has regular updates on progress. The iniquitous nature of England’s libel law has been described eloquently by Nick Cohen, in the Observer. It is used regularly by rogues and criminals from all over the world to silence their critics. All they need is money. Truth is irrelevant. It is a disgrace to a civilised country. The cost of defamation cases in the UK is vastly greater than in any other country in Europe:: look at the graph. With enormous courage, Simon Singh has decided to appeal against the ruling by Mr Justice Eady. Scientists and journalists everywhere should rally to support him, if they value the right to express an honest opinion without being bankrupted by a law court. Singh is taking a great risk on behalf of anyone who values freedom of speech. The charity, Sense abour Science (SaS), has started a campaign to Keep the Libel Laws out of Science. Read the statement about the campaign on the SaS site, and the current list of signatories. The list of supporters is already very impressive. It includes, for example, professor Lord (Martin) Rees, president of the Royal Society and Astronomer Royal, to Dr Philip Campbell Editor-in-Chief of Nature, David Starkey Historian, Stephen Fry Broadcaster and Author and Baroness Helena Kennedy QC Barrister. You can sign the statement yourself there. Do it. Now! You can also get code for the button (above) to link your own web site to the campaign. In 1894, a local Iowa newspaper, The Davenport Leader, wrote of the founder of chripractic, D.D. Palmer, thus. Today, in the UK, no newspaper would dare to express an opinion like that. We all hope that Singh will win the appeal. But even if he doesn’t win in the law courts, he will have scored an enormous moral victory. What’s more, chiropractic is now under scrutiny as never before. There is going to be a chiro-fest that will make the British Chiropractic Association rue the day that it decided to use legal bullying in place of reason. They may even have signed their own death warrant. There is a good roundup of activity up to June 3rd here. The Wall Street Journal (June 4th) discusses the case under the title Britain Chills Free Speech. Bait and switch. Oh dear, oh dear. Just look at British Chiropractic Association tell their members to hide their sins from prying eyes. Excellent round-up of the recent outburst of writing about “chiroquacktic” (Tut, tut, is there no respect? ).